Joshua Hopkins as Count Almaviva (left), Lisette Oropesa as Susanna (center) and Amanda Majeski as Countess Almaviva (right). Photo by Scott Suchman. Dust off your tiaras and opera glasses, the Washington National Opera (WNO) 2016-2017 season is underway. “The Marriage of Figaro” (“Le nozze di Figaro”) is an Italian language opera buffs written in four acts. The score is the brainchild of the inimitable Wolfgang Amadeus Mozart with the libretto by his brilliant partner-in-crime Lorenzo Da Ponte. A sequel to “The Barber of Seville”, “The Marriage of Figaro” is set in Seville, Spain. It’s Figaro (Ryan McKinny) and Susanna’s (Lisette Oropesa) wedding day. Huzzah! But when Figaro discovers that the Count (Joshua Hopkins) keeps trying to seduce his bride-to-be, he hatches a plan to humiliate the Count once and for all. Crazy hijinks engulf the whole household. The original upstairs/downstairs scandal, “The Marriage of Figaro” is a farcical love story for the ages. Amanda Majeski (Countess Almaviva) is a veritable triumph. Marjeski has performed the role of Countess in no less than three prior productions of “The Marriage of Figaro.” As predicted, Majeski’s regal Countess is one of the standout performances of the night. The Countess’s lamentation, the aria “Porgi, amor, qualche ristoro,” soars through the opera hall on the wings of Majeski’s lyric soprano. Hopkins’s Count radiates steamy sexuality with marked notes of perpetual confusion and anger. A powerful bass, Hopkins successfully asserts the arrogant authority of a nobleman. Other notable performances include WNO veteran Elizabeth Bishop and Valeriano Lanchas as the meddlesome pair Marcellina and Dr. Bartolo, respectively. Ariana Wehr is a bubbly Barbarina. Director Peter Kazaras’s staging is playful. He injects refreshing goofiness into centuries old stage antics. Nothing about this staging of “The Marriage of Figaro” feels stale. Set Designer Benoit Dugardyn’s set is neo-classical, sparse and replete with large columns. Costume Designer Myung Hee Cho’s designs compliment Dugardyn’s minimalist designs. Cho relies on bright colors and cascading fabrics to provision a romantic atmosphere. 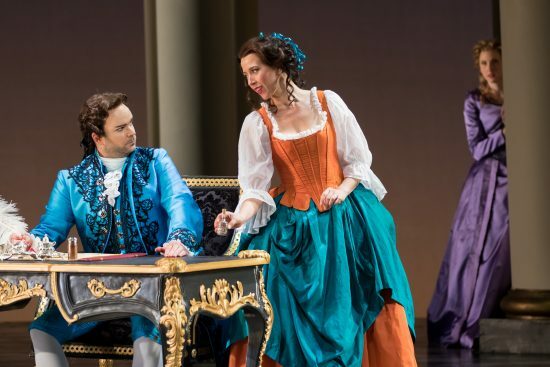 Conductor James Gaffigan makes his WNO debut with “The Marriage of Figaro.” Gaffigan does an admirable job of balancing his orchestra against the vocalists in the restrictive Kennedy Center Opera House. Perhaps you’re not an opera fan. That’s ok! The music and libretto of “The Marriage of Figaro” is so ingrained in popular culture that it is instantly identifiable. “The Marriage of Figaro” may have premiered in 1786 but its comedy has held up well over the past 230 years. As they say at the end of Act 4, let’s bring this comedy, ahem, review to a close. WNO’s production of “The Marriage of Figaro” is light and accessible. A safe production, no great risks are taken. There is no ambiguity or reinterpretation of the characters or the plot. The Domingo-Cafritz Young Artist Performance is Saturday, October 1 and on September 24th the performance will be simulcast free at Nationals Park as part of M&M’s Opera in the Outfield. English subtitles are placed above the stage. “The Marriage of Figaro” runs through October 2, 2016 at the John F. Kennedy Center for the Performing Arts Opera House at 2700 F St. NW, Washington, DC 20566. For tickets call (202) 467-4600 or click here. Jennifer Minich is a DC native and a trained classical vocalist who has performed throughout the DC metro area. She holds an MSc in Museum Studies from the University of Glasgow and a BA in Vocal Performance and Art & Archaeology from Hood College in Frederick, MD. A traveler at heart, she spends most of her days with her husband, Randy, plotting to escape back overseas and continue her education.